M4 Exhaust manufactures exhausts which add power and a more race-inspired sound to your bike as well as lowering the overall weight. Extra time on research and development ensures your exhaust has the ultimate in quality workmanship, ease of installation, and the best performance possible for your motorcycle. M4 Exhausts are available in both Standard / Race and GP Series mounting configurations. The Standard / Race Series Exhaust mounts in the stock position; M4 supplies you with a race bracket to allow the removal of your passenger foot pegs, if desired. Whether hitting the track or sharing a ride with someone, this system has you covered. The M4 Standard / Race Series Slip-On Exhaust has a built-in baffle, tuning the exhaust note for a crisp head turning sound. Unique silencer packing gun insures even distribution of packing material. M4 has built a quality fitting exhaust that is a breeze to install; all mounting hardware and instructions included. The slip-on will shed some weight over stock to give your sport bike improved power-to-weight ratio. M4 slip-ons are designed for use with the stock header assembly. Satin M4 aluminum name plate. Note: All M4 systems are designed and intended for closed-course competition use ONLY. 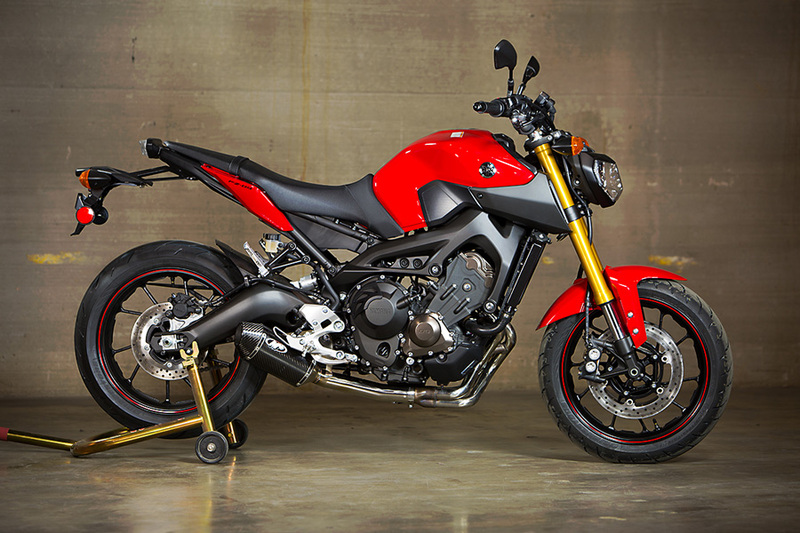 STEP 3: Receive your Performance Package, install, and enjoy your completely transformed FZ-09 / MT-09 / FJ-09 / XSR900 !